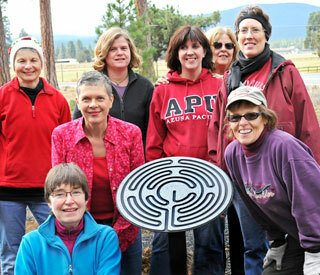 It was all Cohort 3 hands on deck Saturday to put finishing touches on the Sisters Community Labyrinth. Dedication of the labyrinth will take place Saturday, December 1 at 1 p.m. The community is invited to participate in the dedication ceremony. Refreshments and warm beverages will be served after the dedication. The Sisters Community Labyrinth is located in the U.S. Forest Service East Portal, near the corner of Route 242 (McKenzie Highway) and W. Hood Ave. There is handicap and RV parking in the rest area, and additional parking for the dedication will be along the road, or at XPress Printing. The labyrinth is handicap accessible. The highlight of Saturday's work party was planting a sculptural three-dimensional finger-labyrinth, which will enable individuals who are unable to physically walk the labyrinth (or anyone else) to trace the path with a finger. Other work included general cleanup, and positioning of rocks to define and enhance the labyrinth. A rock will be placed in the center of the labyrinth for walkers to sit and reflect on their "journey," and an interpretive sign will be placed on-site. A labyrinth is an ancient symbol that depicts a path to a specific location. Unlike a maze, the labyrinth has no loops, dead ends or forks. Walking the labyrinth quiets the mind, slows the heart rate, promotes relaxation, and helps people tap into their creative energy. This labyrinth is a medieval seven-circuit design like those found on the floors of European churches and cathedrals. This project has been nearly a year in the making, organized by Sisters Cohort 3 of the Ford Family Foundation. The foundation sponsors the Ford Institute Leadership Program throughout counties in rural Oregon and in Siskiyou County, California. After participating in a series of leadership training and team-building classes, each cohort determines a community project, raises funds, and completes the project, thereby putting into action skills acquired during the training phase. Dozens of individuals and businesses have contributed more than $12,000 to the Sisters Community Labyrinth. Major donors include the Ford Family Foundation, Bank of the Cascades, Campbell Foundation, GreenRidge Physical Therapy & Wellness, High Desert Aggregate, Jan and Jack McGowan, Ray's Food Place, Sisters Park & Recreation District, and the City of Sisters. The dedication will bring to a close Cohort 3's involvement. Friends of the Labyrinth, a new community group, will continue to manage the labyrinth. A proposal is being made to Sisters Park and Recreation District, the project's fiscal sponsor, to continue operating under its auspices. Individuals may join Friends of the Labyrinth for an annual donation of $10, or $15 for families. Donations are tax deductible. Friends of the Labyrinth will maintain the labyrinth and plan periodic labyrinth events. For more information on the Friends group, contact Sharlene Weed, 541-420-3014. This is the third community project that the Ford Institute Leadership Program Cohorts have contributed to Sisters. Cohort 1 built the outdoor classroom at Sisters Middle School, and Cohort 2 built dugouts and refurbished bleachers at the Little League field.